Three months prior to the release of Mag Earwhig!, Guided by Voices teamed up with Cobra Verde to release this split 7''. Well, in reality they mostly teamed up to actually become Guided by Voices. Cobra Verde acted as Robert Pollard's backing band on the Mag Earwhig! record. It seems only fitting that this precursor release saw the light of day before the record had. 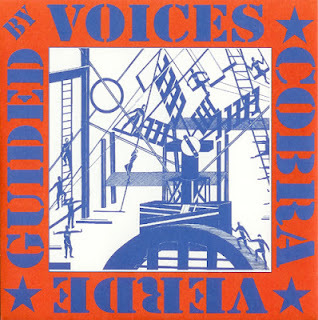 Cobra Verde adds one b-side not reviewed here, but the two Guided by Voices cuts are pretty damn phenomenal. Aim Correctly­- 4 Repetitively dark, and scathing high-end guitar riff carries this song. Having said that, this song takes a turn for the surprisingly catchy. Orange Jacket­ - 4 Has a similar feel to “Marchers in Orange” off of the Fast Japanese Spin Cycle EP. Is it the similarity of oranges? Don’t think so. 3/6 time, hard-rock song with melodic, meandering lyrics, and off-kilter lead riffs from Doug Gillard. Both great songs. I always thought the same thing, Orange Jacket does remind me of Marchers in Orange.